Bake My Day! : Bread Baking Babes in January: A Spelt bread ! Bread Baking Babes in January: A Spelt bread ! Silence in the refter please! This month we have a real Abbess unofficially presiding our table in the Kitchen of the Month. Astrid at Paulchens Foodblog cordially invited Hildegard of Bingen to provide us with food for the soul and belly. Sponge: Mix spelt flakes and spelt flour with the salt. Dissolve yeast in milk and combine everything to a sponge. Cover the bowl with a kitchen towel and let rest for about 15-20 minutes. Add water and lemon juice to the sponge and knead for at least 15 minutes gradually adding the sunflower oil. Dough: Form dough ball and coat with warm water. Cover again with kitchen towel and let double in size. Knead for another 2-3 minutes. Cut dough in 2 equal halves and place each in a baking pan. Cut the surface of both breads about 5 mm deep and let rise again until doubled in size. Bake the first 15 minutes at 200 °C, then lower heat to 195 °C and bake for another 30 minutes. - The longer you knead the dough, the more air will be incorporated - but be careful not to overknead the dough! - It's recommended to place a bowl with water into the oven for the first 15 minutes of baking. - You can also brush the finished bread with some milk and let dry for about 1 minute in the oven. 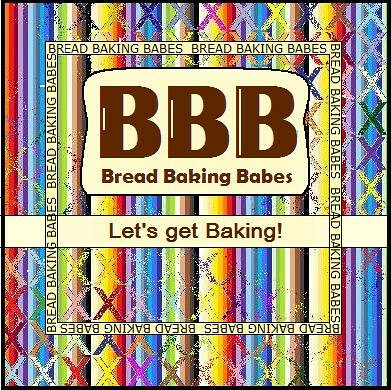 The Bread Baking Babes is a closed group of about a dozen of active members and we like it to keep it small and simple. We love to bake bread and share our experiences while doing so. Even tho the group is closed we are happy if you’d decide to be part of the whole fun and join us as a Bread Baking Buddy. What’s this Buddy thing all about? Every 16th of a month we all post about the month’s bread and the kitchen of the month invites everyone to join and bake the bread with us. If you decide so you will have until the 29th of every month to bake and post about it. Then simply tell the kitchen of the month that you did and send a link to your post. So what’s keeping you? Come on and bake with us! See for all relevant info Astrid’s post at Paulchens Foodblog. They look great! Love the wee buns. The flour gave you lots of loft and great shaping. A spelt bread; we love just the spelt flavour. thank Hildgard from me. Fraud?? that's 10 hail Mary's for you girl! I love those buns too, bread looks very good. I love freshly baked homemade bread. Your spelt bread looks sensational! I'm so envious of the loft on your spelt bread! I know. It has enhancers. But it doesn't look at all like the brick I produced. Whatever the means, the end is great! Love the little rolls. I think they all look gorgeous!